I have examined Z-Wave in the past, a technology that will revolutionize and grow the home automation market. Just as Z-wave is a purpose-built wireless technology, so too are two others that have been developed for the challenging commercial/enterprise market for very different applications. Just as we see in Z-Wave, wireless technology used in commercial settings such as that offered by lnovonics and others is 900 MHZ-based and provides mesh capability. The unlicensed 900 MHz TSM band was specifically chosen for its ability to penetrate walls and floors better than higher frequencies, such as 2400 MHz (2.4 GHz). Commercial office and industrial buildings offer particular transmission challenges by virtue of their construction. Attenuation factors at 900 MHZ range from 1-2 dB through glass to 4-7 dB for brick up to approximately 30 dB for rein­ forced concrete vs. a typical product link budgets on the order of 100 dB. Depending on the number and type of walls and floors in the transmission path, 900 MHz represents a good approach due to the +8 dB wider link budget for this band com­ pared to 2400 MHz. Most wireless devices of this type are battery-powered. "When it comes to commercial applications of wireless, 900 MHz is the sweet spot," says Craig Dever, VP at Inovonics, which manufactures integrated sensor transmitters covering such functions as contact alarms, IR motion detection, smoke/heat detection, glass break and personal duress. "It provides the optimal frequency for commercial building penetration while balancing the need for long battery life." Other techniques are also brought into play to create a robust, reliable transmission environment. Mesh networking creates redundant paths and is engineered for the addition of repeaters when additional punch is needed. The Inovonics topology is capable of managing in excess of 500 transmitters and at least 25 repeaters. The transmission technique of frequency hopping spread spectrum (FHSS) -operating in the 902-928 MHz band -spreads its signal over rapidly changing frequencies in a pseudo­ random sequence known to both transmitters and receivers. Interference from another device at one frequency will have minimal effect on the overall transmission. Conversely, the technique adds minimal noise at any single frequency to the ambient RF environment. These products have been engineered to meet the UL-2560 Standard for Emergency Call Systems for Assisted Living and Independent Living Facilities, requiring 99.99% verification of alarm capture. Is it likely that commercial wireless will replace wired systems? Probably not in the near term, because in most cases, the anticipated cost of transmitters, receivers, repeaters and battery maintenance cannot be justified. However, as integrators and end-users become more comfortable with the performance of these systems, usage will increase because of the application flexibility wireless systems offer in addition to labor savings and bid accuracy. Further, the technology can be deployed as a supplement to wired systems to provision coverage in areas without wires; discontinuous areas owned by a common entity; areas such as retail and museums where displays are frequently moved; asbestos abatement situations; historical or other architecturally sensitive locations; and where mobile duress alarm is a requirement. Turning my attention to the outdoor environment, I was introduced to Nedap Identification Systems about 18 months ago at SecurityXchange. What is particularly interesting to me is its long-range (up to 33 feet) vehicle identification technology, which requires a reader and vehicle tags. Tags are semi-active and operate in the 2.45 GHz bandwidth using modulated backscatter technology. "Semi-active" means that RF energy 'excites' the transponder and initiates the battery boosted response. This type of operation preserves battery life - an important consideration in all wireless transmission. The vehicle identification system has three modes: continuous transmission of the tag ID (default); activation by user; and random transmission of the tag ID. Both reader and tag use a 16-20 bit password which are required to match to result in an output from the reader. The reader reads the encoded data from the tag and transmits the data back to the host system, providing an audible and visible LED indication of a properly read tag. Further, each reader in the system operates on a factory-set frequency offset from frequencies being used by other readers in the system allowing operation of multiple readers in close vicinity of each other without interference. Their "Booster" in-vehicle transponders are a smart combination of transponder and card reader. They read normal access control cards in the vehicle and send both driver information and vehicle in formation to the reader and from there on to the access control system, thus enabling authorization of both vehicle and driver. One version supports AES encryption. With technology originally developed for the Autobahn, vehicles can be travelling at speeds up to 125 mph and information is still read, although an employee driving that fast will likely soon be surrendering his credentials! lt is worth noting that the capabilities of enhanced security from dual-ID technology and high-speed reads -originally intended for toll road applications - offer rather effective asset tracking when combined. "While we often see the use of RF technology in access control applications, the potential for use lies well beyond that. When properly applied, it can be employed for fleet management, asset tracking, time and attendance, operational efficiency enhancements and various other benefits," explains Craig Wilson, Nedap's Marketing Director. "It really just relies on a solid understanding of the capabilities and limitations of the technology as applied with creative design." It is clear that wireless technology is growing in today's security installations. Certainly, products such as these deserve the time investment to develop a solid understanding of their capabilities. 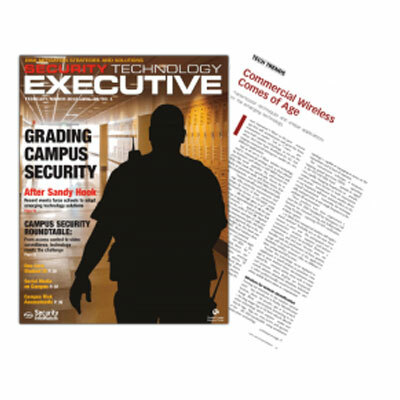 Article by: Ray Coulombe, Founder and Managing Director of SecuritySpecifiers.com and RepsForSecurity.com. Reach him at Ray@SecuritySpecifiers.com, on LinkedIn at linkedin.com/in/raycoulombe or on Twitter, @RayCoulombe.